Coma Dreams is a pulse-pounding thriller that unflinchingly depicts the human propensity for self-destruction. 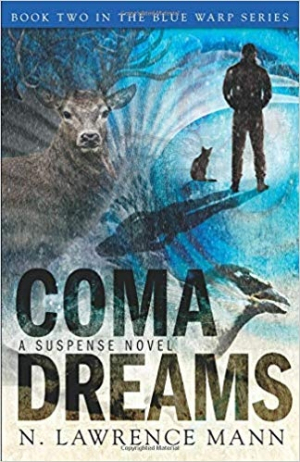 N. Lawrence Mann’s Coma Dreams is a sui generis blend of psychological thriller with science fiction, exploring heavy themes like addiction and loss. While grieving for his daughter, retired Air Force colonel Brett Stafford ends up in a coma after another car crash. Just before his life support is turned off, his friend, Brennen Reynolds, tries to supernaturally revive him. The person who awakes in Stafford’s body is unrecognizable, though—a malevolent force who escapes from rehabilitation and embarks on a killing spree. Reynolds and his allies race to stop the vengeful spirit inhabiting the colonel’s body before it’s too late. This second installment in the Blue Warp series can stand alone, though its sluggish opening delivers plenty of exposition for those wanting to catch up. It is tense and emotional but also funny, and its pulp influence is evident. Moments of comedic relief include Rebecca Stafford expressing more incredulity that her dog-loving reanimated husband would travel around the country with a cat than that he became a serial killer, while other eccentric asides—a cat that texts; a Québécois convenience store inventory; a detailed account of the soul-crushing futility of loving the Arizona Cardinals—delight. Shifting points of view add richness and depth, especially near the end. Even minor characters are fleshed out, and the plot is parceled out through them in a sparing way. The story line is propulsive and action-driven beyond its quirkier moments, and it moves between Boston brownstones, desert mountain ranges, and Estonian psychiatric clinics. Some settings are better described than others, and some figurative descriptions don’t pan out. The dialogue is too monosyllabic to be dynamic, and it contrasts oddly with the more literary narration. The text’s stylistic choices are distracting, including type in all caps and an overuse of italics; unconventional spellings are not explained. Still, the language is generally elegant and attention-holding, and sentences are often short and forward-moving. Pithy and dramatic chapter endings maintain the momentum. Imaginative world-building makes the most of the book’s premise. Its fantastical elements are dark, dreamy, and whimsical, while realistic depictions of human hardship convey the grief of losing a child and the struggles of addiction. Suspense builds toward an ending that resolves the book’s many narrative threads, though it hints at sequels. Coma Dreams is a pulse-pounding thriller that unflinchingly depicts the human propensity for self-destruction.